These beautiful little cookies are a sweet holiday tradition in our house! Cream together butter and sugar until soft. Mix in the vanilla and nuts; then gradually add the flour. Shape into small balls (smaller than a scoop of ice cream, bigger than a tbsp. Shake cookies in a bag of confectioner’s sugar. Set aside until completely cooled. 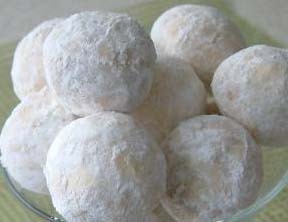 Once cooled, roll again into confectioner’s sugar.